The Moses Mystery: The African Origins of the Jewish People presents Gary Greenbergs controversial challenge to traditional arguments about the origins of ancient Israel. The Moses Mystery was originally released in a hardcover edition in early 1997 and in a paperback edition in 1998 as The Bible Myth: The African Origins of the Jewish People, with some very minor revisions that the publisher failed to include in the original version. The Moses Mystery was published in a Greek Language edition in 1998 and The Bible Myth will be published in Portuguese in 2000. 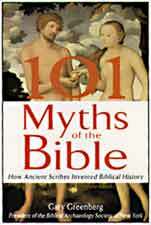 In October 1999 Barnes and Noble ranked The Bible Myth as its 23rd best-selling book on Israels history out of over 1300 titles in its catalogue. Read a sample chapter: Who killed Goliath? Read a sample chapter: Did Moses Write the Ten Commandments? Released in November 2000 by Source books. On February 5th, 2001 Amazon ranked the book at 1,105 on its bestesellers list.